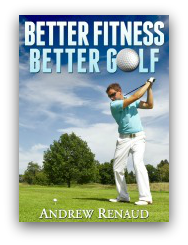 Many years ago, fitness and golf were two words that you likely wouldn't find together in a sentence. This all changed with golfers such as Gary Player, Greg Norman, and Tiger Woods. It is truly these three men that are most known for bringing fitness and golf together. Other aspects of this website focus on specific exercises and techniques that you can perform to improve your golf game. Here, I want to provide you with the rationale behind exercise, its benefits, and why fitness in golf is so important. These guidelines are taken from the CDC, and are for adults 18-64. They recommend two key aspects for improving your overall fitness level: aerobic exercise and strength training. Aerobic exercise included any number of activities ranging from walking, to jogging, biking, swimming, and anything in between. The main intention is to get your heart pumping at a higher rate while working at a moderate or higher pace. The recommendation is two or more days of strength training per week, focusing on all major muscle groups. You also need 2 1/2 hours of moderate intensity aerobic exercise, or 75 minutes of vigorous exercise such as jogging. If you are unfamiliar with exercising and are just starting out with a golf weight training or fitness program, please consult your physician or healthcare professional first. I cannot stress this enough! You need to make sure that you are healthy enough to begin! And that is just naming a few! If you are looking for more information on exercise and physical activity, please check out the CDC Website. All of these will help contribute to an improved game. A proper golf fitness program needs to be well balanced. Weight training for golf is very important, but it needs to be counter balanced with flexibility exercises. One common misconception is that golfers shouldn't lift weights because it will make them bulky, slow, and will ruin their golf swings. This couldn't be further from the truth! Golfers of all ages can benefit from a specific training program for their needs. The main reasons to work out are to increase your strength and flexibility. Improving both of these aspects will lead to more powerful and effective golf swings. However, you shouldn't just go to the gym and try to max out on every exercise. You need to perform higher reps (10 plus) with lesser weights. This way you avoid the bulk and get strong, lean muscles with more endurance. When you swing the golf club as much as you do during each round, muscle endurance is key for being able to reproduce the proper golf swing, fight fatigue, and avoid injury. As a certified Golf Fitness Specialist with NASM, I follow their general training program for golf. The program consists of various phases such as muscle balance correction, flexibility, and then strengthening ranging from stabilization to power. If you are unaccustomed to working out, I strongly advise that you find a golf fitness expert in your area to help you out. While it is true that any fitness professional can train you, having someone who is specially trained in golf fitness will help you maximize your potential. If you are comfortable with exercise, then let this site provide you with specific exercises to add to your program. One of my future goals with this site is, ideally in e-book format, create a general framework for golfers to follow in order to progress their training. In the mean time, if you need any more information regarding specific exercises of a golf fitness program, please investigate the various sections of this site and hopefully you will find answers to all of your questions! *Recommended Resource: If you are looking for more weight training and exercise tips, please go to Weight Training For All. Here you will find some great information regarding working out, exercise, and nutrition for all age and skill levels.